1850 Evening Post (New York City, New York), May 15, 1850, Page 1. The comptroller to whom was refered the communication from the Croton Aqueduct Department, asking an appropriation of $1,600 to procure a water meter, presented a report in favor there, which an ordinance providing therefore. Which was adopted. Pages 14-15: Samuel Huse, Boston. A Water Meter. This machine, which is entirely of a novel construction, consists of a hollow cylinder, of about one foot in length and one foot in diameter, and a solid cylinder of some six inches in diameter, placed within the hollow cylinder. The surface of this solid cylinder is composed of some five or six valves, which extend from one end of it to the other, and are attached by hinges to as many solid portions of said cylinder, of nearly the same width. These valves, when folded, or shut into the cylinder, form a little more than half its surface. Upon one side of the Meter, the space between the inside of the hollow and the surface of the solid cylinders, is so filled as to occupy something more than the width of one of the valves. This filling is made to fit so exactly, as to prevent the water from passing. Upon one side of this filling, the water enters the Meter, and upon the other side the water is discharged. The Meter being so placed that the valves will, by the force of gravity, open as they reverse from under the solid filling, and shut upon the opposite side previous to coming in contact with it. When thus arranged, the water is then let into the cylinder, and comes in contact with the open valves; the inner cylinder revolves until the water escapes upon the opposite side ; and of course, for every revolution of the interior cylinder, a given quantity of water must pass through the Meter. We hardly need to mention, that there are some three or four valves open at the same time, and which are constantly in action. The necessity for a perfect self-acting Meter for measuring water in cities supplied with that element, by what we term Water Works, has long been felt and acknowledged; and it affords us much pleasure to have it in our power to announce to those interested, that we believe that the instrument which we have thus briefly attempted to describe possesses the properties desired, in an eminent degree; is deserving' the honorable notice of the association, and merits the award of a Silver Medal. 1851 "New Motive Power for the Fast Presses," New-York Herald, January 29, 1851, Page 3. This monster press (Hoe's fast printing press) is driven by a novel and moat convenient and powerful little machine, which is seen on the right of the printing press, consisting of a small cylinder, with cog-wheels and a pulley attached. It is called a water metre or power metre, and was invented by that ingenious mechanic, Mr. Samuel Huse, of this city, well known for his efficient labors as assistant superintendent of the Cochituate water works Thia machine was originally invented as a water measurer; and this is the first application of it as a motive power, it being found to possess this power to a most unexpected and extraordinary degree. It is simple, yet wonderfully efficient. It consists of a hollow cylinder, 10 inches wide and 16 inches in diameter; inside of which is a flange cylinder, about 6 inches in diameter. This inner cylinder has flanges, on which are four valves, extending from one end to the other of the cylinder, and attached to it by hinges. These valves, when folded, or shut into the cylinder, form a little more than half its surface. Upon one side of the metre, the space between the inside of the hollow and the surface of the flange cylinder, is so filled as to occupy something more than the width of one of the valves. This filling is made to fit so exactly as to prevent the water from passing upon one side of this filling, the water enters the metre, and upon the other side the water is discharged. The metre is so placed that the valves will, by the force of gravity, open as they reverse from under the solid filling, and shut upon the opposite side previous to coming in contact with it. When thus arranged, the water is let into the cylinder, and comes in contact with the open valves; the inner cylinder revolves until the water escapes upon the opposite side: and of course, for every revolution of the interior cylinder, a given quantity of water must pass through the metre. This is carefully marked by means of a clock which is attached to the cylinder, and which will indicate the precise quantity of water which has passed through the machine in any given time. The revolving flange cylinder is connected, externally, with cog wheels, a shaft, and pulley; and from the pulley a belt extends to the driving wheel of the printing machine. This metre, or water wheel, is driven by the Cochituate water, introduced from a aix inch distributing pipe through a two inch lead pipe; and the flow of toe water is regulated by means of a screw gate near the metre. This wheel, though so small as to occupy only about 24 inches of room, affords about three horse motive power. 1851 "Croton Water," The Daily Crescent (New Orleans, Louisiana), February 4, 1851, Page 2. Water meter invented by Prof. Forshey, rejected by New Orleans water works. 1851 "Great Mechanical Improvement - A new use of the Boston Aqueduct," New-York Daily Tribune, February 6, 1851, Page 6. Since the introduction and use of the Cochituate water in Boston, it became very necessary to ascertain precisely the quantity of water made use of daily by the large establishments in Boston, as the engineers and the owners could not agree as to the probable amount. Those having the water-works in charge, instead of waiting tor accident to produce a machine suited to the purpose of measuring the water, sought among the mechanics in their employ and in the State, for one possessed of the skill most likely to succeed in the enterprise. Mr. Samuel Huse, formerly a citizen of Newburyport, was selected for this undertaking. He has succeeded in producing an instrument which admirably answers the purpose. By the employment of this machine in Boston over most of the street of which tbe water in the pipes has a head of from 80 to 100 feet, it has been discovered by Mr. Huse that the water would pass the meter or measurer with such force as to superadd an efficient power. He has perfected, according to the statements of a correspondent of the Newburyport Herald, his invention and secured letters patent, and has set his meter in operation for driving the printing press of a daily paper in Boston. Through a two inch lead pipe, a stream of Chochituate water is introduced into a meter which only occupies 24 square inches. The fall of water between the Boston reservoir and this meter is about a hundred feet. This two inch stream will discharge 60 gallons of water each minute, and in passing through the meter will gave a motive power equal to what is called three horse power. This is more than sufficient for driving the press. It is less hazardous than a steam engine, requires no attention and is always in readiness. It can be used where steam engines would not be allowed. This invention will be of immense service to the various mechanical and manufacturing establishments in Boston, enabling many more of them than formerly to make use of this power in their various processes. The invention is one of much scientific and mechanical interest, while to us, we must confess there is a trifle additional interest from the fact that it comes from a citizen of our native town. 1851 "Water Meters and Fire Telegraphs," by Caleb G. Forshey, February 4, 1851, from The Daily Crescent (New Orleans, Louisiana), February 11, 1851, Page 2. It was put up at the office of the water-works, and a committee of men of science tested it, and reported it completely successful for the purpose intended. It was then offered to the water-works for one-half of the water saved in any one year after its introduction, or for three thousand dollars. The offer was declined. I have made arrangements with the water-works of Cincinnati to introduce it, but have not recently learned how they progress. 1851 "Water Meter," Boston Evening Transcript, February 14, 1851, Page 2. An old subscriber to the Transcript wishes, through its medium, respectfully to inquire of the "Water Commissioners," if there cannot be some gage arranged at each house, as is the case in the Gas Company, by which the quantity of water used may be correctly ascertained, and paid for accordingly, instead of the present system. There seems to be no good reason, or justice, in one house, which uses say 100 gallons a day, paying the same as another that uses 1000, or other misuses it, by suffering it to run to waste in the night time. Economy. Page 60: New Water Metre. Sealed proposals will be received at the office of the Croton Aqueduct Department, Rotunda Park, until February 27th, 1851 at three o'clock p.m., for five ⅝ inch Water-Meters, ten one inch water meters, and ten 1¼ inch Water-Meters, to be of the kind now in use by the Department, and known as Huse's Patent. Also ten ⅜ inch Water-Meters of such kind and description, whether patented or otherwise, as may be approved on trial, and accepted by the department. To be delivered as may be required. The names of two responsible sureties will be required to accompany each proposal. 1854 American Water Meter Company incorporated, April 10, 1854. 1854 Daily Telegraph (Jersey City, New Jersey), August 24, 1854, Page 2. Water Commissioners. On motion, Coms. Hill and Randall were appointed a committee to procure suitable water meters. 1854 New York Herald, May 22, 1854, Page 8. Office of the American Water Meter Company, 116 Broadway.- New York, December 21, 1854 - Proposals will be received by this company at their office until the 25th instant, for making 1,000 meters. All necessary information will be given by calling at the office. The proposals must name the time when the meters, or each hundred of them will be delivered, as well as the price charged. The contractor will have the benefit of all moulds and patterns now on hand. Ossian Gregory, Secretary. 1854 The American Water Meter Company, Incorporated Under the Laws of the State of New York, 116 Broadway, New York: Daniel Tyler, President ..
1855 Evening Post (New York City, New York), June 28, 1855, Page 3. 1859 Report of the Cochituate water board, to the City council of Boston, for the year 1858. January 6, 1859. Page 9: The subject of meters has received a good share of the attention of the board; and it is a pleasure to state that Worthington's meters, which have been tested to a considerable extent, bid fair to be reliable. Made of iron, they are subject to corrosion; but made of composition, they are thought to be unexceptional. Their cost is higher than is desirable, but it is deemed best to use the most expensive. As the Hewes meters, which have been in use for several years, are found to be imperfect and unreliable, the Board have ordered (in addition to 12 now in use on trial,) 63 new composition meters of Worthington, the cost of which will be near $5,000. The use of meters in several cases appears to be indispensible, and it is thought best, in replenishing the stock of the city, that an article worthy of confidence, both in accuracy and durability, should be obtained. 1860 "Patent Water Meter," Commercial Bulletin (Boston, Massachusetts), March 24, 1860, Page 4. 1860 "Cheap Water," The New York Times, October 9, 1860, Page 4. An assessment for a quarter of a year, made by the water registrar under the direction of the water board of Boston, at the rate of two cents for each one hundred gallons of water used in a hotel in Boston, the daily consumption of which, as measured by a water-meter placed therein under the provisions of the city ordinance, exceeds 10,000 gallons a day, is legal; although water-meters have been put into only a portion of the hotels in Boston, and although the assessment, if made according to the provisions of the city ordinance applicable to hotels into which no water-meters have been put, would have amounted to only about one fourth as much. 1861 "Waste of Water," American Gas-Light Journal 2:364 (June 1, 1861). In the report of the Cochituate Water Board of Boston, Mass., it is stated that the amount of water used during the year averaged the enormous amount of 97 gallons to each individual daily! 1861 Boston Evening Transcript, October 4, 1861, Page 2. Mr. Samuel Huse, formerly connected with the Cochituate Water Works, has received an appointment as sailing master of the steamer James Adger, now at the Brooklyn Navy Yard. 1862 The water metre, and the actual measurement system of charging for public water, by Frank Grant Johnson, M.D. 1870 National Meter Company organized in Brooklyn by John C. Kelley, January 5, 1870. 1870 An act to incorporate the American Water Meter Company. March 31, 1870. .Jacob W. Pierce, Thomas Parsons, B. F. Nourse, and G. H. Ashcroft; capital $48,000. 1870 Price list of water meters, valves, pressure regulators, steam gongs, and plumbing materials manufactured by the Union Water Meter Company, Hamilton Street Worcester Mass. The city authorities of Brooklyn are manifesting some apprehension regarding the enormous waste of water in that city. That a vast and unnecessary drain is thus made upon the supply is fully evidenced by the fact that the amount now used averages fifty gallons per day for every individual of the population, and it is in view og the circumstance that the present yearly consumption would soon exceed the capacity of the reservoirs, now 40,000,000 gallons, and necessitate the incurring of heavy additional indebtedness of the city, that the municipal government is seriously considering the introduction of water meters. It is estimated that the expense of these appliances, extending their use into families, would be about $1,000,000, and the yearly cost for repairs some $100,000. All manufacturing establishments in Brooklyn are metered at the present time, and are paying at the rate of two cents per hundred gallons. We notice that the Commissioner of City Works makes reference to the fact that numbers of the water meters now in use have cost with their connections from $50 to $70 each. This sum, he justly believes, is unnecessarily high, and considers that suitable apparatus may be obtained at less figures. The subject of introducing water meters in New York has also been discussed for some time, and will eventually be adopted. It would be well for inventors to turn their attention to this matter, as there will be a large market opened for cheap and efficient forms of water meters one of these days. 1873 Catalogue and price list of the Union Water Meter Company, by Union Water Meter Co.
1879 "Water Supply and Water Meters," by Samuel J. Burr, from Engineering News 6:370-372 (November 15, 1879) Discussion of "Gem Meter" made by National Meter Company. 1879 "The Barton & West Water Meter," from Engineering News 6:378-379 (November 22, 1879). Manufactured by J.B. West, of Rochester, New York. A large force of workmen are also engaged in construction of Worthington water meters. These machines, of which there are over 20,000 in daily use, have been adopted by all the principal water works in the United States and Canada. 1881 An Act to authorize the city of Boston to attach meters to buildings which it supplies with water. April 15, 1881. Page 1116: Prices for Worthington water meters, June 28, 1881. New York City received a 30% discount from the market or schedule price. United States Water Meter Co.
1882 "The Waste of Water," Engineering News 9:187-188 (June 10, 1882) Report of the Joint Standing Committee on Water, city of Boston. 1883 "The Tremont Meter," Engineering News 10:424 (September 8, 1883) Certificate of Organization of Tremont Meter Company. 1883 "The Tremont Meter," Engineering News 10:435 (September 15, 1883) Report of the Boston Water Board. 1888 Report of Water Meter Testing Commission, Boston Water Board. Tests of 35 water meters. 1889 First Annual Report of the Executive Committee of the Citizens' Association of Boston. Presented February 25, 1889. Page 43: The total number of water meters in public use in the United States, is but 124,798. But from a careful, conservative estimate, and considering the claims of the several meter manufacturers, it is probably safe to say that at least 175,000 water meters have actually been made and sold in this country. 1893 The Metropolitan water meter. Manufactured by the Metropolitan Meter Co., 22 Norfolk Avenue, Boston, Mass., August, 1893. Includes information on many meters. 1893 Thomson Meter Co. : water meter manufacturers under the Lambert patents. 1895 Descriptive circular and price list of the Westinghouse water meter : and water meter appliances manufactured by Fuel Gas and Manufacturing Co.
1900 "Water Works Management - Professional and Councilmanic," by John C. Trautwine, Jr., from Fire and Water 27:202-205 (June 9, 1900) Reprint from the above article with graphs included. Page 478: New York City. - Finances. Again, the water commissioners recently requested that water meters be supplied, and although the cost was comparatively small, and the increased revenue accruing to the city would have been disproportionately large, the board refused to grant it on the ground that it would increase the debt, and contribute to the already too great sinking fund. Page 170: An Ordinance to prohibit the installation of water meters in any premises in the City of Philadelphia, and repealing so much of the ordinances approved July 9, 1897, and July 27, 1901, as authorize and direct such installation of said meters. June 27, 1904. 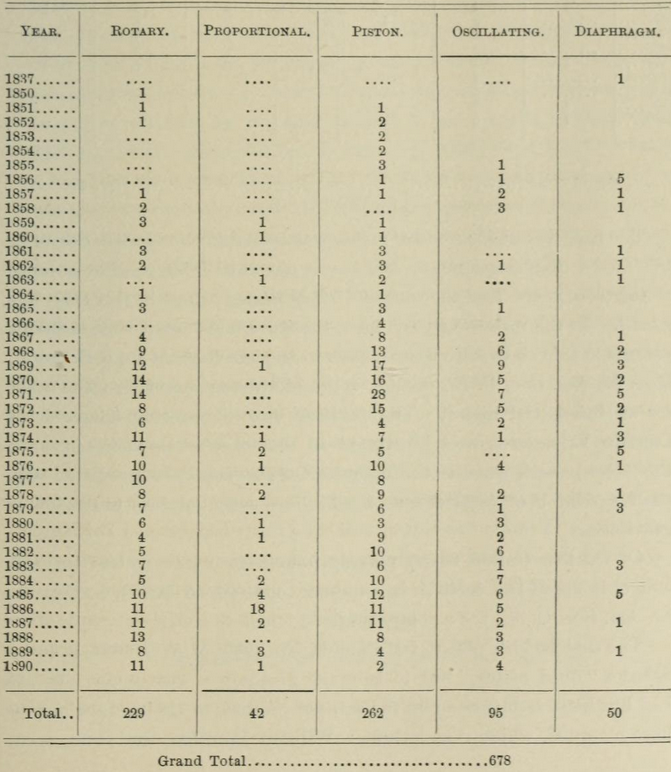 Pages 650-652: Resolution Relative to the Installation of Water Meters, March 15, 1906. Rejected installation of 400,000 water meters at $16.00 each. Asbury Park, New Jersey; Atlanta, Georgia; Atlantic City, New Jersey; Cleveland, Ohio; Detroit, Michigan; Fall River, Mass. ; Harrisburg, Pennsylvania; Hartford, Connecticut; Lawrence, Massachusetts; Lowell, Massachusetts; Madison, Wisconsin; Milwaukee, Wisconsin; Newark, N.J.; Providence, Rhode Island; Richmond, Virginia; St. Louis, Missouri; Springfield, Massachusetts; Syracuse, N.Y.; Taunton, Mass. ; Wellesley, Massachusetts; West Orange, New Jersey; Yonkers, New York; Chicago, Illinois. 1909 "Decide Water Meters Are Useless," Chicago Tribune, May 13, 1909, Page 20. The council committee on water recommended for passage of an ordinance wiping out about 3,000 water meters now in use. In Chicago the Council Committee on Water has just recommended for passage by unanimity an ordinance providing for the abolition of the three thousand water meters which the city now has in use. Page 211: An ordinance to repeal an ordinance approved June 17, 1904, prohibiting the installation of water meters. July 13, 1912. 1913 "Women scent millions of grant in water meters for homes," The Day Book (Chicago, Illinois), October 10, 1913, Page 1. Say 300,000 homes will be soaked for $30,000,000 if Water Meter Deal goes through - Chicago Women will fight a big steal. 1914 "The Cost of Leaks in Water-Works Systems" by Edward S. Cole, from Engineering News 68:371-374 (August 22, 1912). Includes per capita water consumption and meter adoption in 163 cities. 1919 "Why Meter," American City 20:522-523 (July, 1919). With cartoon. 1936 Sixty-First Annual Report of the Department of Public Works for the year engine December 31, 1936. Page 234: The first United States water meter patent was issued in 1850, and by the mid 1870s meters had been developed with legible dials that facilitated meter reading. Page 124: Before the mid-1870s, meters did not have legible dials, and they functioned poorly in turbid water or in water with sediment. The National Museum of American history boasts what may be the world’s largest and finest collection of historic water meters—108 in all, each one made in the United States. from 1837 to 1890, inclusive. 1 U.S. Patent 425 Oct 12, 1837 James Bogardus New York NY Improvement in the machine for measuring fluids.